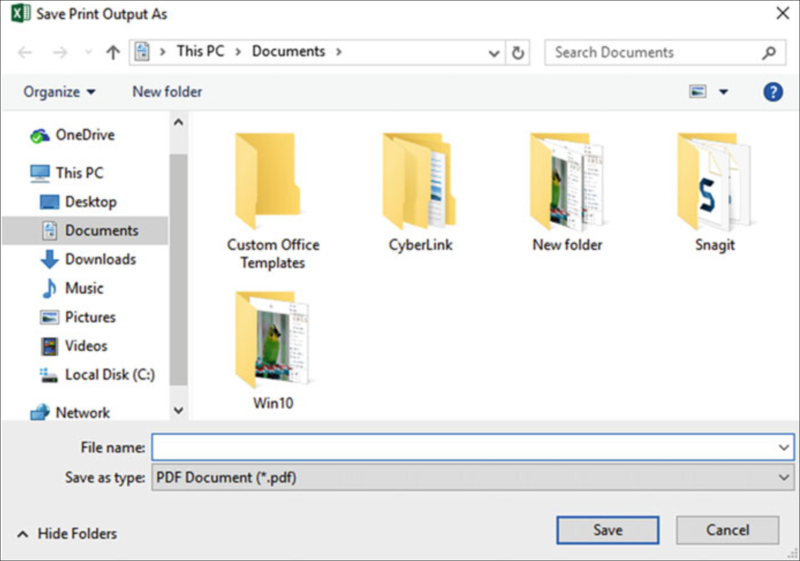 With Windows 10, you can turn any file into a .pdf file just by using the Print command. Rather than printing the contents of a file to paper, you print your document to a .pdf file that shows your information precisely as though it were imprinted on a bit of paper. Since pretty much every program can print information, each program can make a .pdf file that you can share with others. 1. Open a file that you want to save as a .pdf file such as a word processor document, spreadsheet, or slide show presentation. 2. Choose the Print command by clicking the File tab and choose Print. A Print window opens. 3. Click the Printer pop-up menu. A pop-up menu appears. 4. Choose Microsoft Print to PDF. 5. Click the Print button. A Save Print Output As dialog box appears. 6. Click the folder where you want to save your .pdf file. 7. Type a descriptive file name for your .pdf file. 8. Click the Save button. Your .pdf file gets saved in the folder and file name that you chose. To open and view the contents of a .pdf file on any computer, you would normally use a special PDF viewing program such as Adobe Reader. However, if you don’t have the free Adobe Reader program installed, Windows 10 will open a .pdf file in the Edge browser program so you don’t need to download and install Adobe Reader on your computer. To open a .pdf file on a PC, you can just double-click a .pdf file in the File Explorer window.